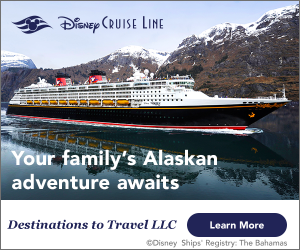 7 Disney Thrills That Are Better at NIGHT! The thrills and coasters at WDW are some of the best anywhere, but many of them get even better when the sun goes down! Let’s take a look at 7 Disney thrills that are better at NIGHT! This is not for the faint of heart! While Astro Orbiter always feels faster than, say, Dumbo – at night it really does feel like you could rocket to space! 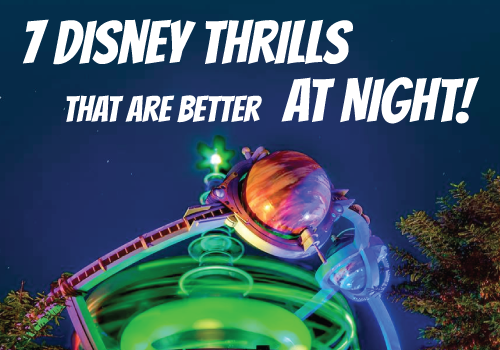 We don’t know if it’s the height or the lights around Seven Seas Lagoon, or the sight of Space Mountain and Disney’s Contemporary Resort all a-glow… but this is absolutely our top pick for a nighttime thrill at WDW! This coaster is way better at night than during the day! The rocks are light up beautifully, and if you time things ride you might spot some fireworks overhead! It’s the ultimate thrill! While a lot of this flume ride is indoors, the outdoor portions give you great views of Magic Kingdom at night! This is your chance to get a sweeping view of Animal Kingdom at night, and the darkness adds an extra element of fear to this already exhilarating attraction! A new offering on this daytime classic may not have as much animal activity, but you’ll certainly see some animals and behaviors that are quite different at night! We like riding around sunset for better visibility than in the pitch-black, but the ride does include some special lighting to make you feel like you’re in twilight on the savannah! Note, this experience is a little shorter than the daytime ride as it takes a different route. If you don’t mind getting a little wet at night, you may not have too much of a line to ride this water-based thrill! The heightened experience after the sun goes down comes from an almost totally dark riding experience – you won’t be able to see the lush jungle as you would in the day, so you don’t know what’s coming next! This thrill was made for nighttime. From your long walk down Sunset Boulevard with the hotel lit up like an eerie beacon, to the queue through the darkened hotel grounds, to the view from the ride itself at the top of the tower… you’re sure to feel a chill or two down your spine! 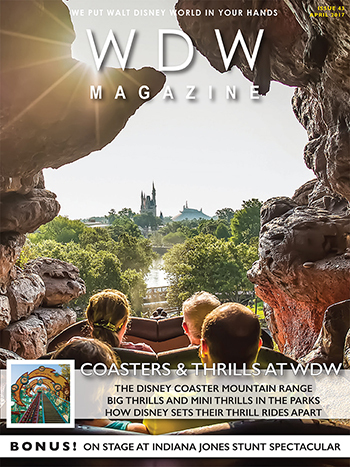 Be sure to get more information about Coasters and Thrills in this month’s WDW Magazine. It’s a great issue! Walt Disney World has some great thrill rides and a lot of them are a whole different experience at night! don’t miss them!